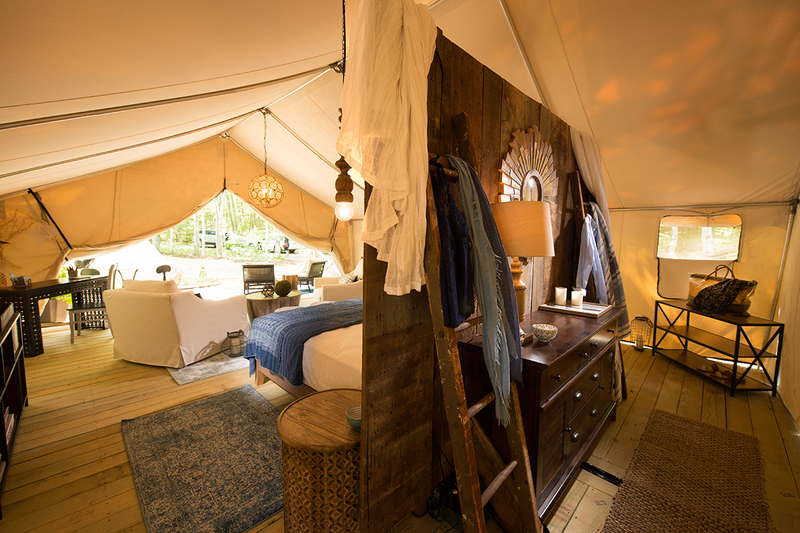 Remember that stunning sneak peek of Maine’s new glamping experience? 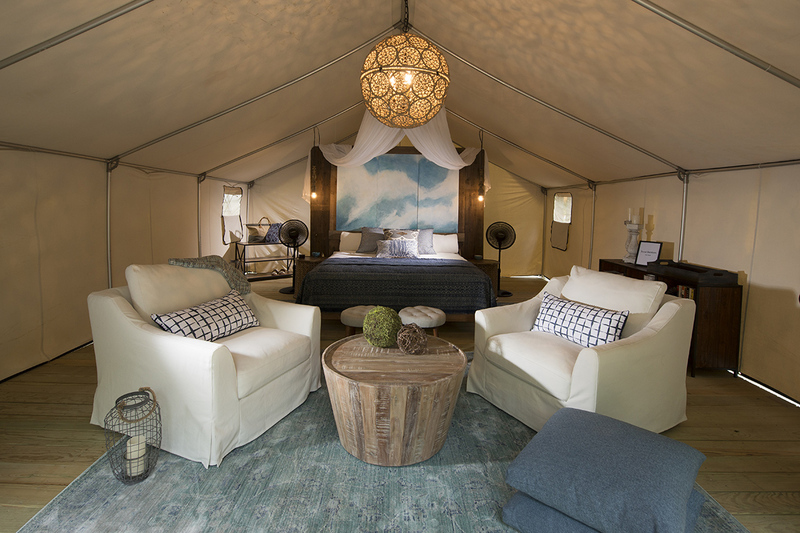 Earlier this year, Sandy Pines Campground in Kennebunkport announced it would be launching professionally designed glamping tents for its first season of operation. 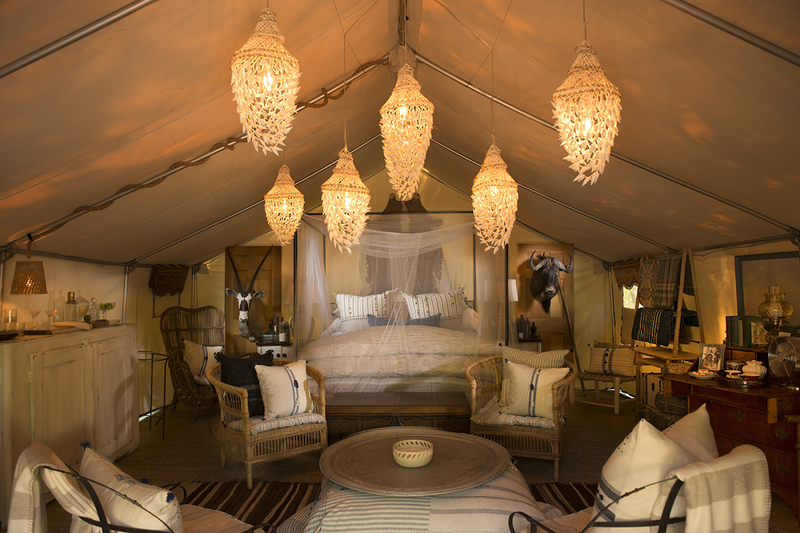 Now, the finished tents are finally here—and they’re amazing. 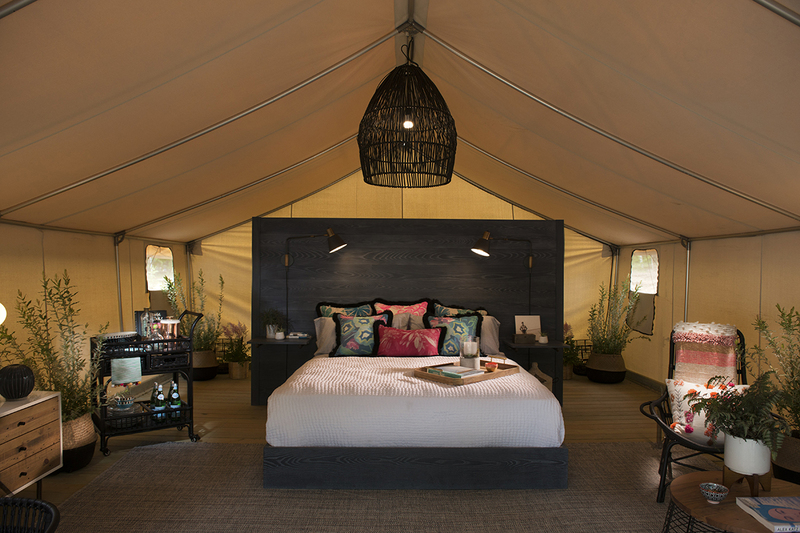 Sandy Pines founders Debra Lennon and Tim Harrington tapped 12 New England interior designers to outfit the campground’s safari-style glamping tents. 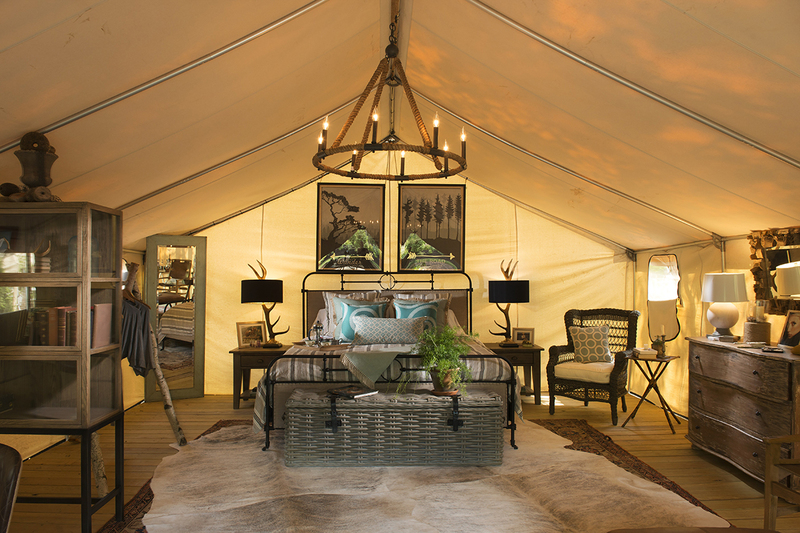 (Glamping, by the way, is a portmanteau of the words glamour and camping.) 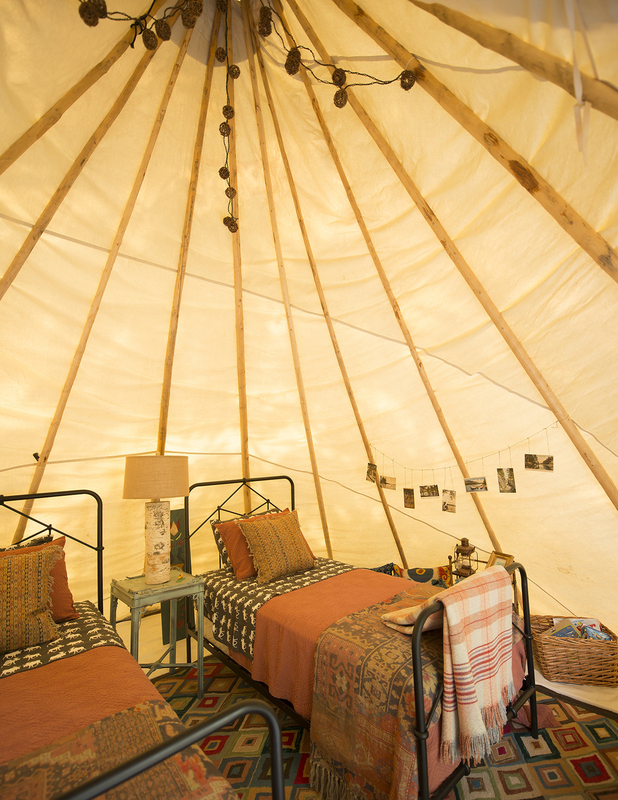 The result is a group of tastefully appointed, fully furnished hideaways. 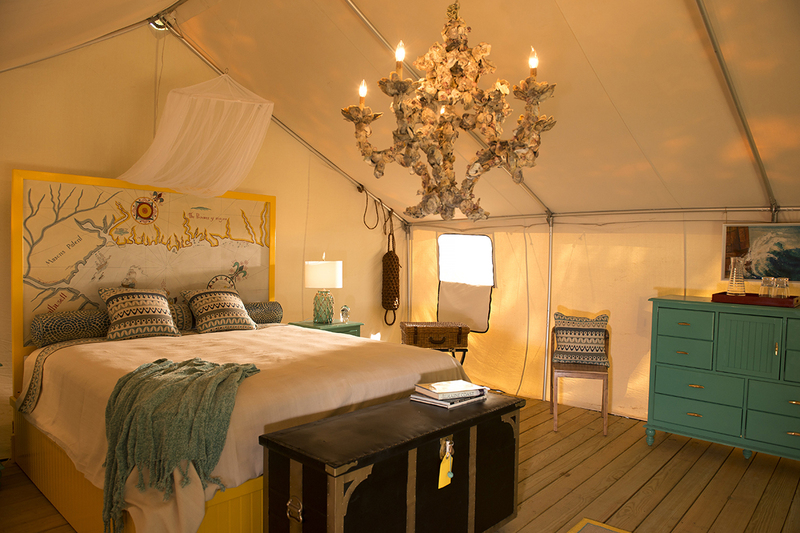 The tents stretch to more than 500 square feet, offering cozy sleeping and living spaces, plus local art and plenty of stylish accessories. 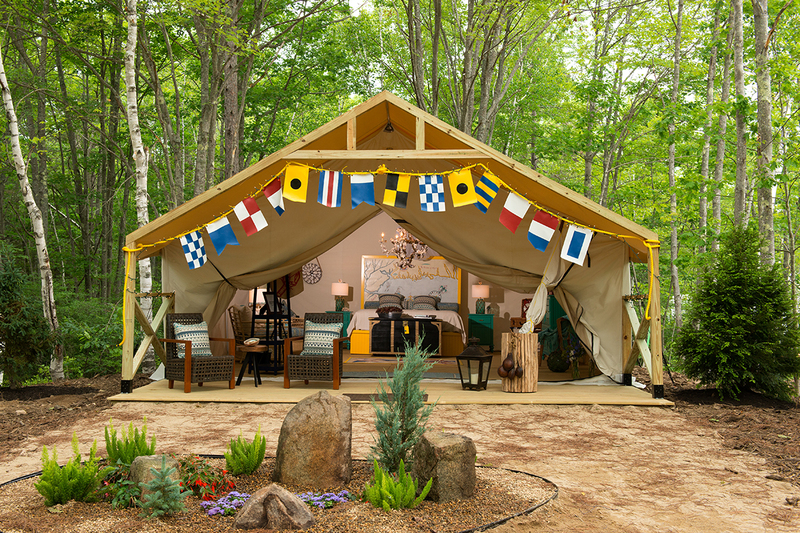 The tents’ designs run the gamut, from nautical-themed to bohemian. 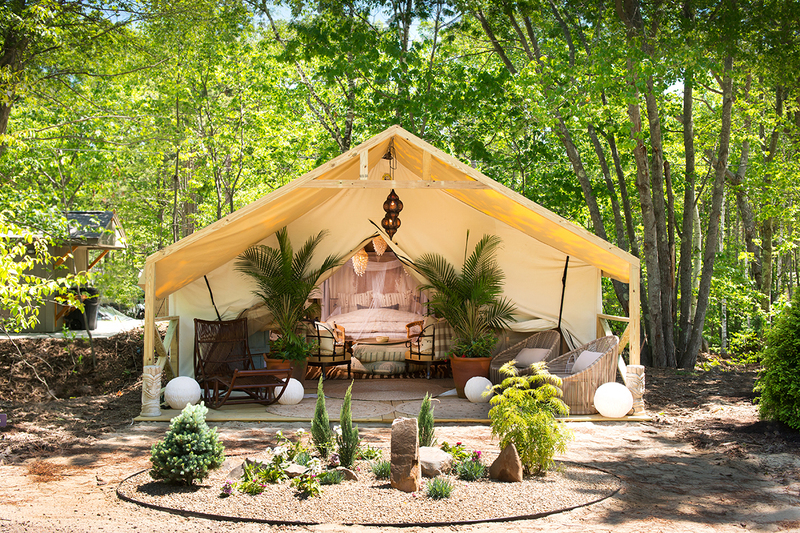 “Blixen’s Oasis,” dreamed up by Yarmouth, Maine-based Nicola’s Home, features taxidermy and rattan chairs, while “Bohemian Retreat” by Kennebunk’s Antiques on Nine boasts a bold chandelier and a desk with a typewriter. 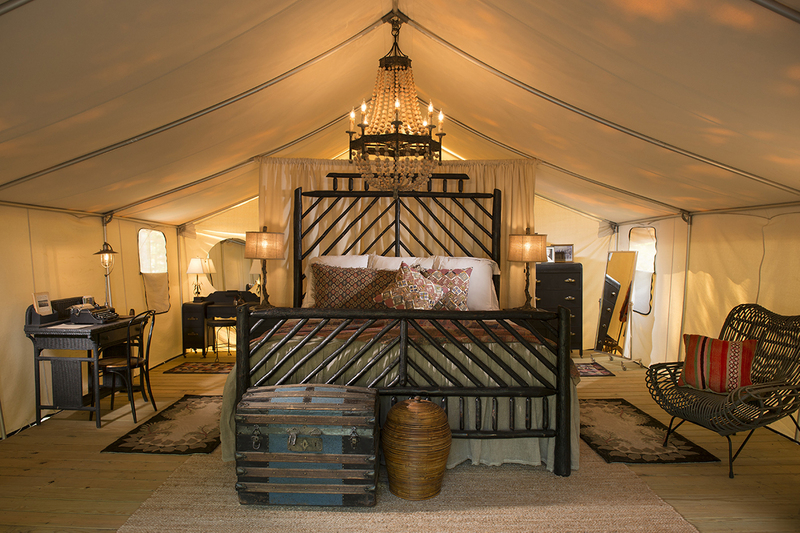 Each tent is one of a kind, mixing antique furnishings with contemporary accents. 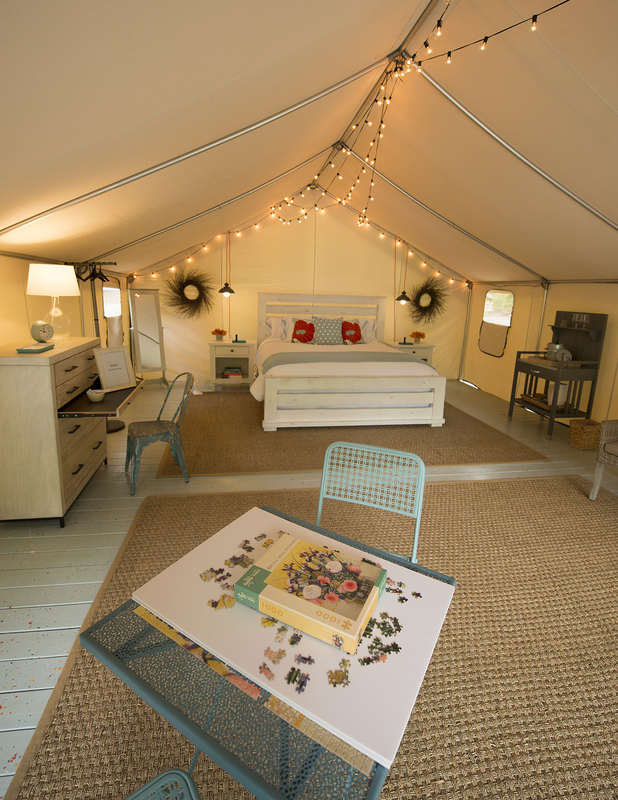 Beyond its eye-catching glamping tents, Sandy Pines offers tiny houses to rent, as well as the classic accommodations of a regular campground—visitors have the option to pitch tents or hook up RVs. 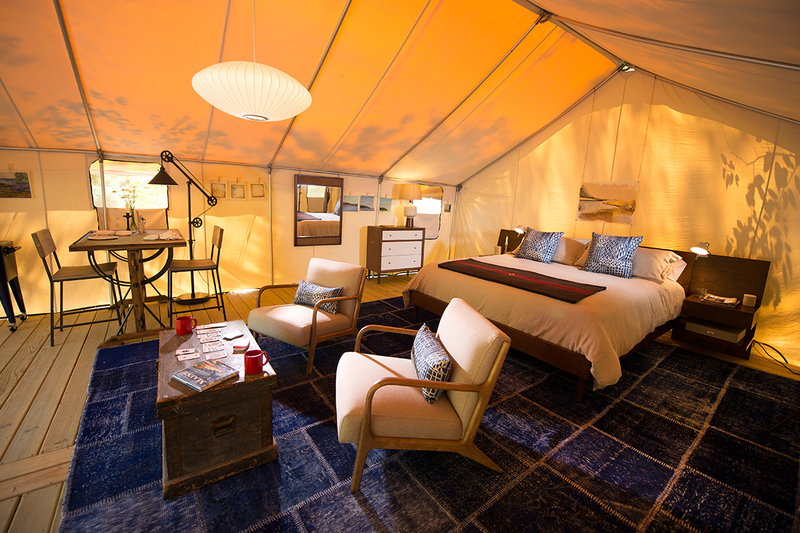 The campground aims to mix resort-style luxuries with an authentic, outdoorsy Maine vacation experience. There’s no shortage of New England charm, either; amenities include a farm stand, a general store, an old-fashioned ice cream cart, and a lobster pound. 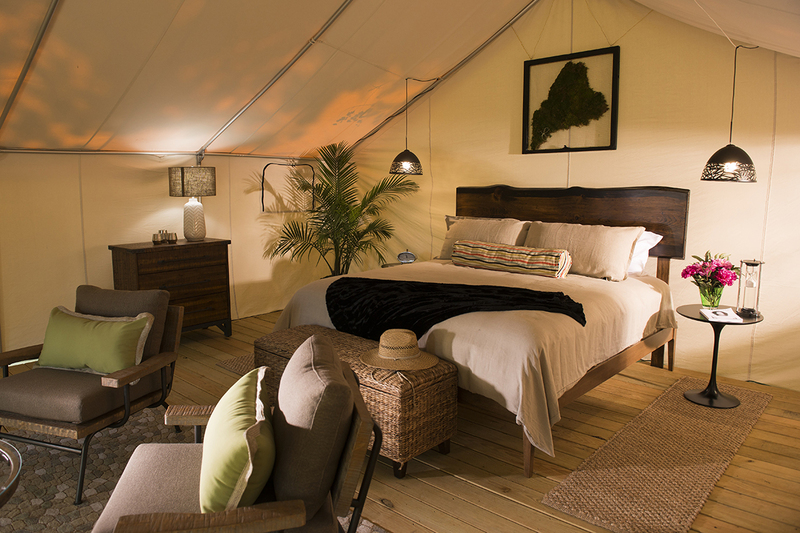 For outdoor adventurers, there are ropes courses, a heated saltwater pool, bikes and pedal carts, paddleboards for rent, and a kayak launching point. 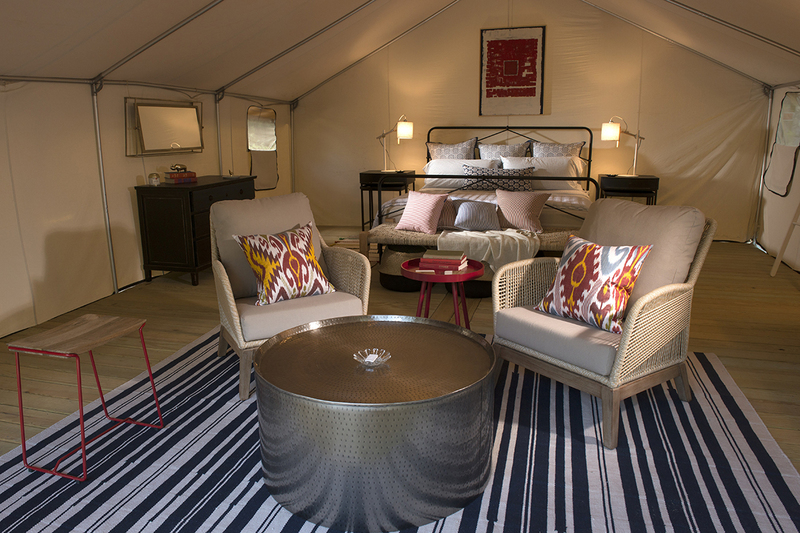 While rates vary depending on the method of camping, Sandy Pines’ glamping tents range from $174 to $314 per night. (You can book them here.) 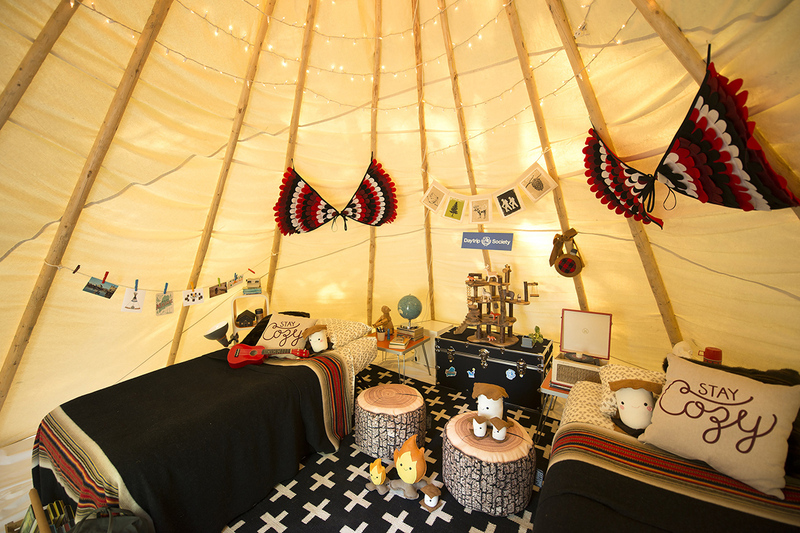 Below, peek inside all 12 designer tents.